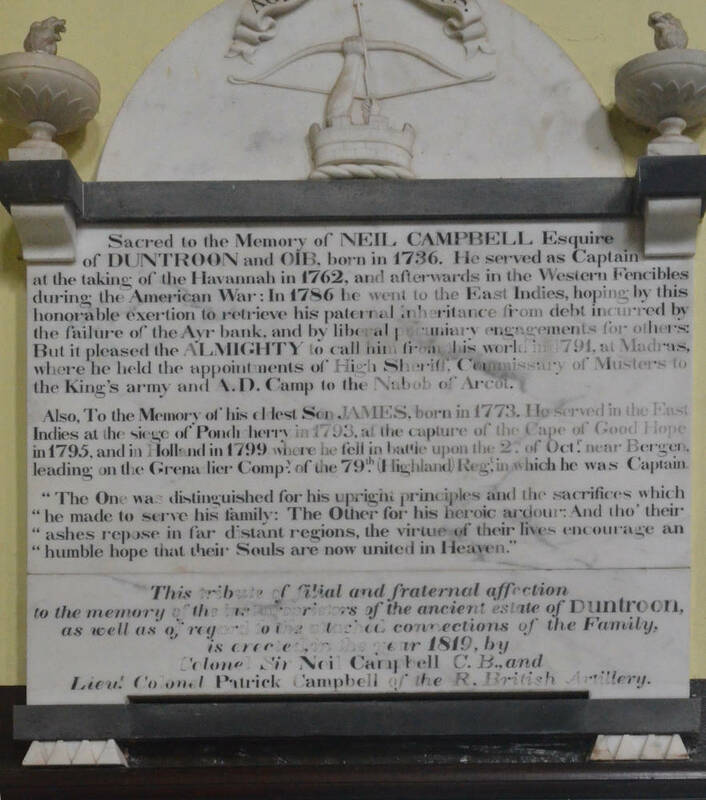 Sacred to the Memory of NEIL CAMPBEL Esquire of DUNTROON and OIB, born in 1735. He served as Captain at the taking of the Havannah in 1762, and afterwards in the Western Fencibles during the American War: In 1786 he went to the East Indies, hoping by this honourable exertion to retrieve his paternal inheritance from debt incurred by the failure of the Ayr bank, and by liberal pecuniary engagements for others. But it pleased the ALMIGHTY to call him from this world in 1794, at Madras, where he held the appointment of High Sheriff, Commissary of Musters to the King’s army and A. D. Camp to the Nabob of Arcot. Also, to the Memory of his eldest Son, James, born 1773. He served in the East Indies at the siege of Ponchberry in 1793, at the capture of the Cape of Good Hope in 1795, and in Holland in 1799 where he fell in battle upon the 2nd of Octr. near Bergen, leading on the Grenadier Comy of the 79th Highland Regt in which he was Captain.